In the panoramic penthouse Skygarden holiday dreams were. Panoramic location and facilities will make your stay an experience. 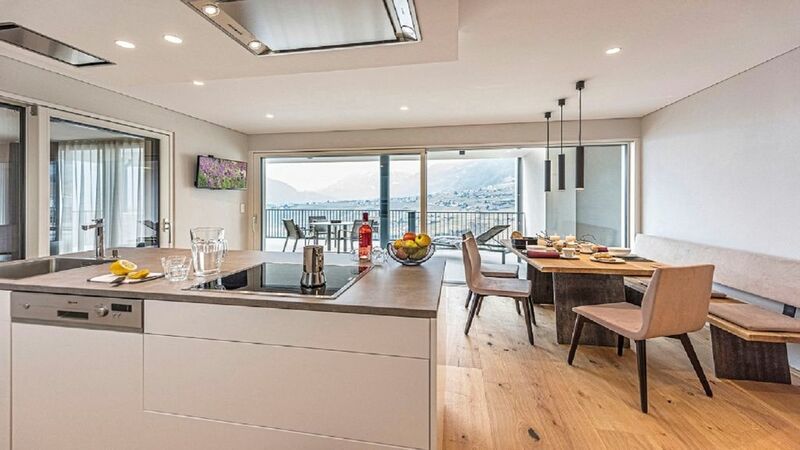 In prime location, overlooking the spa town of Merano, the village of Tyrol and the mountains of the Texel Group awaits you in 2018 completed panoramic penthouse Skygarden. It has 2 bedrooms with adjoining shower rooms, a living / lounge area with fully equipped kitchen including island, and a loggia with a comfortable seating area and dining table. A highlight is certainly the 100m ² large panoramic balcony, on which invite a whirlpool and a Finnish sauna to relax. For your vehicles there are 2 adjacent parking spaces (total 5x5m) in the underground car park. For vehicles with superstructures, an outdoor parking space is available directly at the entrance. The center of Scena is only a few minutes walk away and offers various shops. There, the bus lines to the excursion destinations Meran2000, Bergbahnen Taser and Verdins, as well as to the gardens of Schloss Trautmannsdorf begin. Restaurants are also within walking distance, the German-Italian cuisine will inspire you. At Lido Schenna you have free entrance. There is also a tennis court and a bowling center. Rent a scena bike to explore the area. You will also find hiking trails in Meranerland for all demands: from the Waalweg to the glacier tour. Golfers will find beautifully situated golf courses in Lana, Appiano and in the Passeiertal. During the winter months, the ski areas Meran2000 above Schenna and the Schwemmalm in nearby Ultental await you. Es war alles da was das Herz begehrt, die Wohnung ist super, herrlicher Ausblick, tolle Lage, sehr freundliche Ansprechpartner vor Ort. Ausstattung war auch super!